“Encounters always disclose unknowable variables, this is even more evident when the encounter is a flourishing struggle between permanent individualities who, in order to honor a specific shared commitment, must trespass each one in the field of the other and contaminate while retaining themselves. Identities are clothes, sometimes not comfortable, to put on and show off, not to set aside and keep safe. Teresa Cervo and Massimo Pastore have lived this mutual measure, visiting the universe of the other, in a creation where one is never certain to distinguish a road that leads to the top from a descending slope. The curator, let me quote myself, in this case is a mere vector; but also a buggy has its modest relevance and proposing to Teresa Cervo to enter in that sacred space that had already partly been delimited by Massimo Pastore was a trial that could easily slash the harness and make the ‘vehicle’ unstable. But we have come to an end with a rencontre made of signs that do not end in their evidence (many could stop at those signs without knowing how to read them) and which will live secret paths in those who know how to accept their immediacy. The Sacred Space (Lo Spazio Sacro) is such a vast extension that the only idea of building a balustrade to delimit it and make it resonate with the infinite (amazing paradox that only art grants) appears superhuman: but is not this what we do expect from artists? In their encounter, Teresa Cervo and Massimo Pastore, revealed to be seekers of silence, of space, of the night that is around the world, of the light that is around the heart. Both of them have suspended their installations: a verticality that, as any indefinitely extended line, meets the celestial sphere in the two points of acme, the zenith and the nadir. 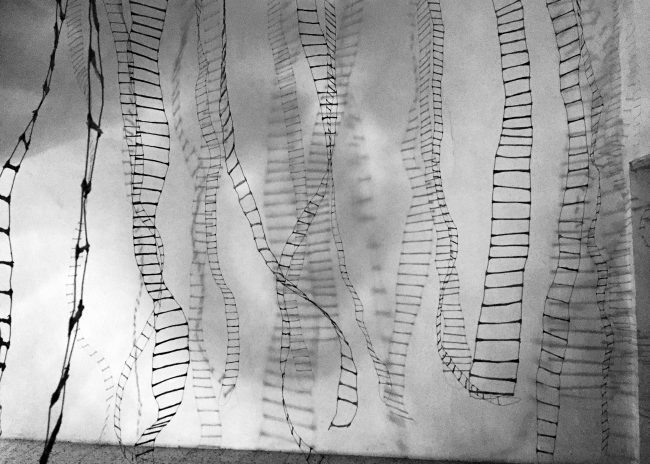 Thirty-two stairways in paper, iron, empty space, light to go through and spying your own shadow on the walls, becoming giants for a moment; seven photographic images in the form of kakemono (specific Japanese way of organizing an image in the shape of a scroll intended to be affixed vertically) that make the man bearer of that same line that meets the celestial sphere, which connects only seemingly distant worlds. If in the works composing Pastore’s implant pervades a metaphysical process that is effectively fixed in “Sintesi 39″ that recomposes the hour before sunrise and the last hour before sunset, Teresa Cervo produces in the connection structure, decidedly physical, representing all meanings that stairway possesses: of representation, of reduction, of parameter, but not of access to a defined place (transcendence of the utopia). In Pastore’s kakemono there is the immanent way indicating that of transcendence (probably of emptiness) and in the artist’s decision to organize images in this form, I verify the visual impermanence of the work itself in its possibility of being rolled up to become ephemeral. “Still we must somehow put ourselves in a position to see the other, to approach him with a clear mind. It is necessary to be predisposed to the encounter, to have no particular delay or mental blackmail that pushes in the opposite direction, towards that oasis of the untouchable in which we all propose to be, with rancour, at least once in life. It is more or less what is said to those who are looking for a new love. An empty space is required to let in a person, a kind of frivolity is necessary. The thirty-two iron and paper stairways by Teresa Cervo, that vertically cross the space like an irregular plot, play with our first and most basic ability to be touched for what is poetic. The strings that moves the artist are perhaps the most superficial of our susceptibility but her minimal poetry manages to instantly pour on the visitor something not optional that then accompanies him, stifling uproars and giving him a slight sense of guilt. That is what happens, moreover, when one approaches the sacredness, which here in the distance soars like a hill, in the last room. The sacredness, always only perceived as a sound that compresses the hearing, leads to silence, inclines downwards the head of the person who crosses it. It is also an unfriendly and baroque void for a West accustomed to associating it with the grand ecclesial architecture. The sacred flows at its own sleepy rhythm. Massimo Pastore appears to have grown up, more cryptic and introverted. 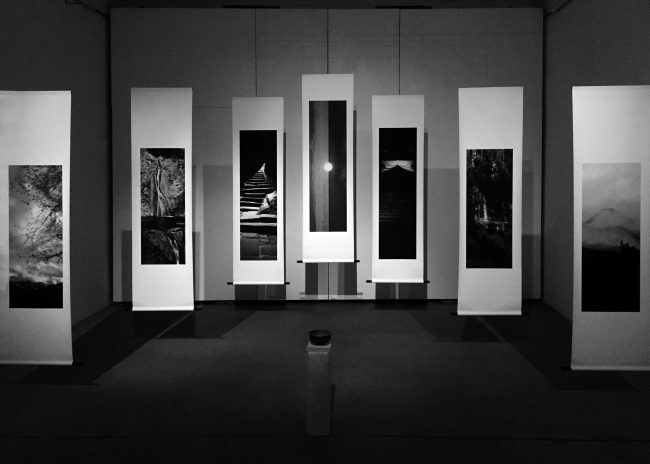 His works, seven photographic images in the form of kakemono, as a roll of Japanese inspiration destined to be hung, recall those stories that Pastore once declaimed with ardor and that now, instead, saving his breath, let it hang with more force from above, in an atmosphere of research and caution that is not yet true peace. We might expect a new explosion, a roar that nevertheless does not come. Not here, not now. The influences suffered by Massimo Pastore, the obvious interest in a non-servile but disciplined religiosity is essential to understand the meaning of his images in which there is no human sign. We can recognize that the Vesuvius, superimposed on Mount Fuji, reveals to all intents and purposes the meaning of a mutation that has not yet been completed.